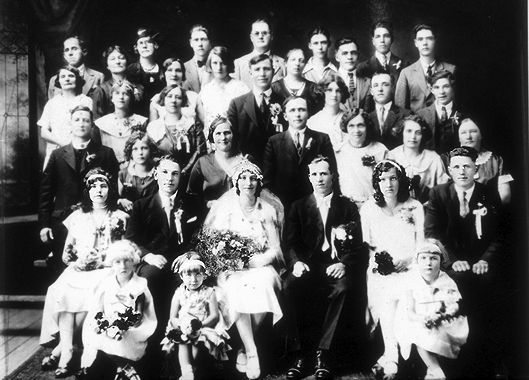 Polish Canadians Are White, Therefore No Longer "Ethnic Enough"
Although the Polish-Canadian community (called "Canadian Polonia" by Polish-Canadians) is sometimes spoken of as a unity, it is in fact divided into numerous groups and subgroupings, depending mostly on the time of arrival in Canada. Obviously, waves of immigrants have come from much different Polish societies, and have arrived in much different Canadian societies. There have also been minorities among the immigrants whose relations to the Polish-Canadian community have greatly varied, notably Polish Jews. While one of the most stalwart Polish-Canadians was the sociological scholar Benedykt Heydenkorn, author of numerous worthwhile books about the Polish-Canadian community, others had highly negative feelings towards Poland. The main waves of Polish immigration to Canada could be identified as pre-World War I; interwar; post-World War II; 1956-1979; Solidarity era; and post-1989. Before World War I, Poland had endured Partition (harsh foreign occupation under Tsarist Russia, Prussia/Germany, and the Habsburg Empire) since 1795. Independence was regained only in 1918. The Polish Second Republic fell before the savage onslaught of Nazi Germany and the Soviet Union (then Hitler's ally) in September 1939 (when World War II began). It is today relatively little-known outside of Poland that a combined total of about five million Christian Poles perished under the genocidal occupation policies carried out by Nazi Germany and the Soviet Union (the latter occurring especially during 1939-1941, when Stalin was Hitler's ally). Betrayed by America and Britain at the Yalta Conference, Poland was assigned to the Soviet sphere of influence (to be officially called the People's Republic of Poland) — along with the wrenching displacement of her frontiers in a westward direction. Stalin and his henchmen imposed hard-line Communism on Poland, rejecting the possibility of permitting considerable internal autonomy, which happened (for example) in the case in Finland. In consequence of the death of Stalin in 1953, the coming to power of Wladyslaw Gomulka in October 1956 essentially "polonized" the regime and moved it away from the harsh, grinding totalitarianism of the Stalin era. The disturbances of 1968-1970 brought Edward Gierek to power, whose economic policies initiated a short period of considerable prosperity. Nevertheless, the election of the Polish Pope in 1978 galvanized opposition to the Communist regime, culminating in the flowering of the independent trade-union movement, Solidarity. On December 13, 1981, Communist General Jaruzelski declared martial law and attempted to crush the Solidarity movement, which went underground. Finally, the impetus of Solidarity was one of the factors that helped to initiate the massive transformations that resulted in the collapse of the Communist regimes in Eastern Europe in 1989. The Polish Third Republic was proclaimed. The main socio-cultural and political eras in the far, far more placid Canadian history occurring in roughly the same time-frame could be identified (for example) as pre-1867; Confederation to 1965; 1965-1982; 1982-1993; 1993-2006; 2006-2015, and post-2015. These correspond to the adoption of the new flag, and the beginning of the waning of traditional Canada (1965); the arrival of the new Charter of Rights and Freedoms (1982); the Mulroney era (to 1993); the Chretien (and Martin) era (to 2006); and the Harper era (2006-2015). As of the 2015 Canadian federal election, the Harper era has come to a close, and the Justin Trudeau era has begun. The arrival of Polish-Canadians increased the intra-European diversity of Canada. It could be argued that the initial definition of "multiculturalism" in Canada was mostly meant to refer to other European groups, apart from the English and French, especially Eastern and Southern Europeans. That definition has been mostly eclipsed since the 1980s, with the arrival of huge "visible minority" immigration. Today, Polish-Canadians are seen as mere members of a once homogeneously "White Canada." Although everyone among the various groupings and subgroupings of the Polish-Canadian community may be "of Polish descent" — they in fact have distinctly different self-definitions and cultural preoccupations. Coming from much different Polish societies, and arriving in much different Canadian societies, fundamentally changes the self-definitions and cultural preoccupations of persons, even if they are said to belong to the same ethnic group. Poles in Canada have mostly failed to establish a line of generational continuity. Thus, while young people continue to arrive from Poland, the young people of the generations born in Canada, are almost invariably lost to Polishness. There does not seem to be a strongly-active and more intellectual forum or setting or context where a dynamic, intermediary, somewhat enduring, emphatically Polish as well as Canadian identity can get underway and be worked out. For those young persons who have maintained extensive ties to Polishness, there has frequently occurred a high degree of cognitive dissonance. On the one hand, they had mostly accepted the enculturation by their Polish parents, viewing Polishness as a very large element of their lives, yet at the same time, they had very great difficulties with ever finding a recognition of the importance of Polishness in the society at large. Thus, their inner map or picture or understanding of the world was set on a path of fundamental tension with the prevailing societal environment. Those few young people who clung to extensive elements of Polishness were likely to have found the dissonance rather difficult to bear. And they had virtually no groups of peers within the Polish-Canadian community to interact with, or find a degree of comfort or reassurance with. What seems to be the invariable destiny for virtually all persons of Polish descent in Canada, is to melt and meld into the rather bland category of the so-called mainstream. And it could be argued that the so-called mainstream is not a particularly exciting place to be today. In Canada, unlike in the U.S., multiculturalism policies — especially in the 1970s — did give considerable attention to so-called "White ethnics." The increasing diversification of Canada has meant that Polish-Canadians are seen as less and less important. Most Polish-Canadians are astounded at the pace of the demographic transformation of Canada. They remember a time when they were considered as "too ethnic" — but now, they are seen as "not ethnic enough." The prevalent, current-day mood of postmodernism and multiculturalism in Canada should in theory encourage the construction of various, strongly-felt intermediary identities — one among which could be the Polish-Canadian. However, this does not appear to be happening, as far as the creation of a more collectively-felt and lasting identity for those persons. It would be in the interest of the Polish-Canadian community to see limits on current-day immigration — over 80 percent of which consists of "visible minorities" — since Polish-Canadians are becoming regarded as less and less important under the newer forms of multiculturalism. There is also the fact that the immigration numbers are now so huge, resulting in very rapid and massive demographic shifts. It would also be in their interest to cultivate a distinct Polish-Canadian identity, which would allow them to resist the various blandishments of the current-day North American pop-culture and consumer society. It may be noted that in Poland today, there is a salutary resistance to alien immigration, and most of the country remains proudly patriotic. Canada and Poland could be seen as polar opposites within the broader Western world.